There’s a classic joke that was a favourite in our house for some time. What is worse than finding a worm in your apple? A: Finding half a worm. This very silly book (good silly) explores exactly this idea. 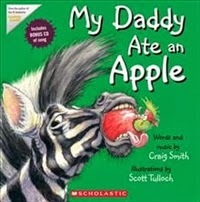 When Zebra’s daddy eats an apple he accidently eats a worm as well. And the consequences are not too good for poor Daddy. Kids are going to love the funny story, sing-song lyrics, and fabulous illustrations which enhance the humour. The worm - it was a fuzzy one, a buzzy one, a great big fat juicy one –also stars in many of the pictures and has as big a personality as the daddy zebra. The picture of the worm hanging on to Daddy’s tonsils before being swallowed is very funny. I also love the trip to hospital on the elephant ambulance, and the nurses (monkeys) taking Daddy’s x-ray, and ... I could go on. The illustrations are delightful. The words fit cleverly into a well-known tune and kids are going to love how Daddy’s stomach ache is resolved. Craig Smith plays the guitar and sings the song on the accompanying CD and will keep young children happily entertained and engaged. Smith is also the author of the wildly silly and very popular The Wonky Donkey.